It's hard to say enough about Eb Eberlein and his contribution to our successful hike across the Grand Canyon. Three novices to the backcountry wanted to do something they have never done before. Eb and his organization took care of all the planning, provisions, and equipment. Our job was to get in shape. Much to our delight, Eb was so much more than a trailguide. Like our first night after dinner when Eb brought out his traveling guitar and sang a few of the country/folk songs that he has written over the last 22 years. Eb has been a cook, a taxi driver, a fire fighter, a logger, a handyman, and a teacher. 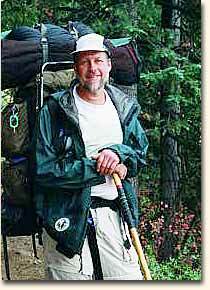 He has backpacked, with and without pack animals, across much of Arizona and has worked in nearly every western state. During the water crisis at Phantom Ranch, he provided the Ranger Talk in their absence and entertained with a few songs as well. Eb has a collection of his songs on CD. When I listen to them I am instantly transported back to the Canyon. Get You a Stream puts me back at Bright Angel Creek while Raven on the Red Wall brings back images of the rims and wildlife. Eb's company Sky Island Treks merged with another company a while back. I understand that Eb is a tour guide for Hydros Adventures. If you use them for your Grand Canyon excursion, you should certainly ask for Eb.